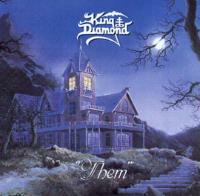 King Diamond has a way of making albums that are really great horror stories set to song. Them is one of the best of those. The music on the disc is hard, somewhat abrasive prog metal, but the story told is incredible scary stuff. If you are ready to get chills down your spine from listening to an album, put this one on for sure. This one starts the creepy tones with dissonant music a sound effects, covered by eerie spoken words by King. More narrative sets the tone for the tale to unfold. Hard and fast with a killer set of chops, this one is a strong rocker that really works. This track comes in even faster than the last one, speed metal tones dominating. It continues this ghost story in fine fashion. This one is a bit more melodic, but still packs plenty of metallic fury. Frantic again, this one rocks out hard in a rather quirky fashion. "Bye Bye Missy" has a killer metal crunch riff and it really rocks out. As the horror story continues the ghosts kill King's sister. The horror of his sister's death brings King out of the spell woven by his Grandmother and the ghosts of the house. He makes his escape. This music is quite Metallicaish at times, but in the older 'tallica mode. It also has elements of Iron Maiden, but still is all King Diamond. It drops down to an acoustically driven melodic segment for a time. Another that feels a little Maidenish, this is a fast hard-edged rocker. King end's his Grandmother's reign of terror and flees from "Them". This one has some great dramatic haunted textures from time to time. Haunting melodic tones with a very melancholy and powerful texture start this song. It begins slowly building in frightening but beautiful tones. It signifies King hearing the voices of "Them", and those are the only voices we hear. King finds himself confronted by the police and on his way to be put away. It is another frantic metal jam that really rocks. It gets quite quirky at times. His entire stay at the asylum is encapsulated on this cut. At the end he is "back on the outside" and heading back to the old house. King enters and is greeted by his dead Grandmother and Sister for more tea. This is just that, a very strange horror movieish phone call. It is a bonus track on this release, an outtake not on the album in its original release. Another cut that is a bonus not originally on the album, this is a more rough around the edges take on the number, under produced, feedback and all. Another rough, under produced demo of the final song, this is also a bonus track.